Okay, I'm sure by now you have all already seen these exciting new pictures but I just HAD to share them with you all! If you've read my blog, twitter, facebook page, know me - or just noticed my blog header... then you will probably know how much of a Disney fan I am! And what's more amazing than Disney? Disney themed make-up! Yes, with Cinderella coming out next month (YAY!) Mac are releasing a beautiful collection dedicated entirely to it! For once this is a collection that I will happily invest in - and that's not just because it is Disney related! But... the Cinderella collection looks so, so wearable - pretty pinks and nudes, subtle pretty colours plus perfect sultry shades too! 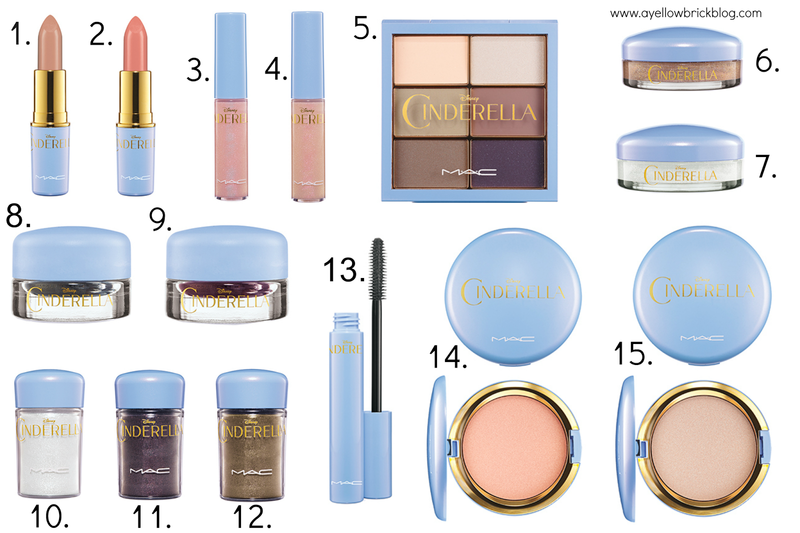 I personally love the packaging, the baby blue of Cinderella's dress and the glitz and glam of the gold go perfectly together - super pretty Mac! I really hope I can get my hands on some of it when it goes on sale (I've heard March) - although I know it's going to be a struggle! Top of my wishlist - 2, 5 and 14! Will you be investing in this new collection? Oh my god haha 2,5 and 14 were exactly what I had my eye on. I've never bothered with their limited edition stuff before but I think I need this if only for the packaging alone! Can't wait! OMG such a beautiful collection! I need those lipsticks! I can feel a whole in my bank account coming. My favourite make up brand and my favourite disney princess collabing 😭 everything I've ever wished for! I love the pretty packaging! This collection looks so gorgeous although I dislike how tacky the packaging looks. I'm so looking forward to this collections release. I just hope that I can actually purchase a product or 2 before it sells out. What cute products - I love their names. Looks lovely but don't like the packaging, can see where they're coming from but think it cheapens it, doesn't look high-end! Ahhh that's such a beautiful collection, I love it when company's do themed products and packaging! Might haven't check this out when it's released, got my eye on those lipstick! Ooooh the pigments are beautiful! But it was her super cute slogan print T-shirt that really won us over. timberland outlet uk It's from Asos and features a super cute dog print and cheeky slogan. As dog lovers and Kim lovers it's a sure fire winner for us. timberland outlet sale If you feel the same way then click (right) to buy it now. At only 16 it's an easy and affordable way to inject your wardrobe with a playful twist for the new season. cheap timberland boots Or get a similar look with our edit of canine and feline inspired tees below. I am so excited about this collection, everything looks super pretty. That Royal Ball lipstick is what I need in life! Are the pigments actual glitter? I am so so excited for this collection! The colours are perfect and like you said so wearable (I'm not the bravest when it comes to bright makeup!) 2, 5 and 14 are definitely on my wish list too, and I think I'll have to add 10.